Monster Bash was a PC game released in 1993 by Apogee software. For its time it was a great game with decent gameplay, graphics, sound and gore which was always a plus back then. Apogee were a game development company which had some very strong titles under their umbrella. Titles such as Commander Keen, Duke Nukem, Wolfenstein 3d, Blake Stone and Monster Bash were all of the Apogee seal. Apogee would re invent it self as 3d Realms some years later. So the story begins when some evil count steals the main characters dog (and many other pets) for some unexplained reason. So in order to get the dog back you have to fight your way through grave yards and many other horrific scenarios to get your furry friend back safely. The main character is called Johnny Dash and he pretty much looks exactly the same as Might Max except for he has really gay pajamas on. Johnny Has a sling shot which has unlimited stones to pelt at the zombies, monsters and other creeps that await him in the side scrolling levels. The game was in 3 parts (like most games back then) and the first part was always free (shareware) and the other discs were what you had to pay out for. PC games 9 times out of 10 would use this format for many years even right up to the Duke Nukem 3d days of gaming. 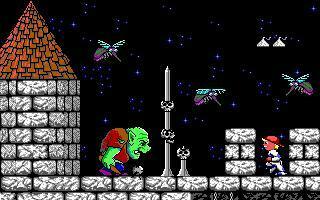 Gameplay consisted of killing monsters and unlocking caged animals. You could not proceed to the next level without rescuing all the dogs and cats first. 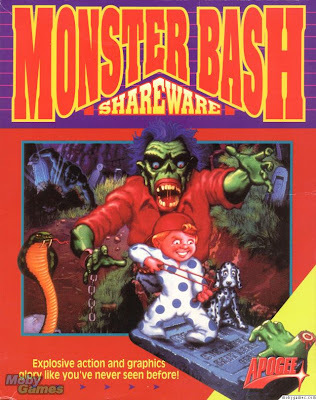 The game had a surprising amount of gore for a game aimed at kids but back in the early 90s PC games could get away with a lot more than console games could so Monster Bash slipped under the radar compared to the likes of Mortal Kombat. 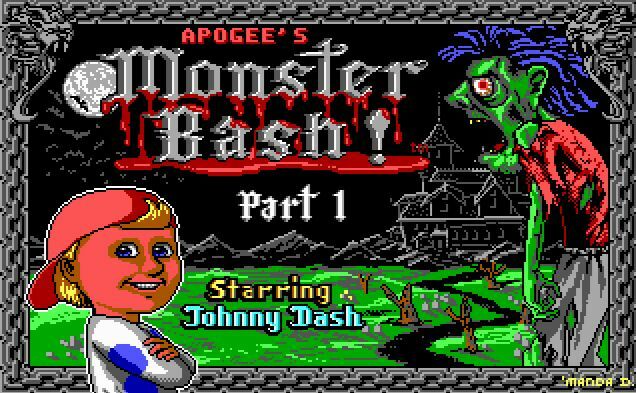 Playing Monster Bash will always be a fond memory for me. In the early 90s we invested in a Windows home computer and this game along with Commander Keen, Duke Nukem, Wolfenstein, Alien Carnage, Blake Stone and Doom were some of the coolest games I had ever played at the time.